Ethernet represents the plumbing pipes of the Internet. Many network installers and system integrators are familiar with Cat5e and Cat6 cables with RJ45 connectors. But the term “Ethernet”, co-invented by Robert Metcalfe, encompasses an entire range of twisted pair and fiber cables that are constantly being upgraded and standardized by the Institute of Electrical and Electronics Engineers known as IEEE. Each new iteration of Ethernet, or category, supports increasingly faster bandwidth speeds and improves upon noise cancelation. Cross sections of different category types of Ethernet reveal differing internal physical compositions. This guide will help you learn more about the subtle differences between each generation of twisted pair Ethernet cable. Ethernet cabling differences can be invisible to the casual observer. However, each new generation introduces copper pairs with tighter twists and more complex sheathing. Many earlier Ethernet generation cables have become obsolete. 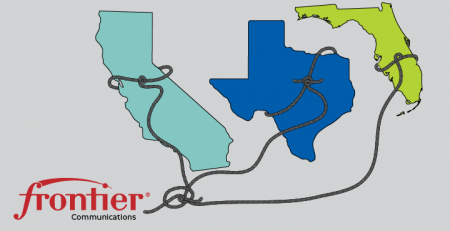 Cat3 cable is an earlier generation of Ethernet but can still be seen in older deployments. With the ability to support a maximum frequency of 16 MHz, this type of Ethernet can still be used for two-line telephone systems and 10BASE-T networks. CAT3 cable can also be used for alarm system installation or similar applications. 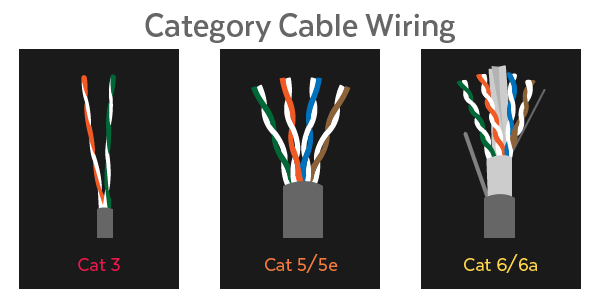 CAT3 cable can have 2, 3, or 4 copper pairs (though uncommon). Category 5e cable, however, has become the default Ethernet category of choice with the ability to support faster speeds and frequencies. Cat5 Ethernet, introduced 10/100 Mbps Ethernet over distances of up to 100 meters, also known as Fast Ethernet. Even though some older deployments still use CAT5 cable, it is now considered obsolete and has since been replaced by Cat5e. Though Cat5 and Cat5e cables are physically similar, Category 5e Ethernet adheres to more stringent IEEE standards. “E” is for enhanced, meaning a lower-noise version where the potential for crosstalk is reduced. Crosstalk is interference that transfers from adjacent wires. Cat5e is the most common type of cabling used for deployments due to its ability to support Gigabit speeds at a cost-effective price. Even though both Cat5 and Cat5e support a maximum frequency of up to 100MHz, Cat5e has completely replaced its predecessor. Gigabit Ethernet utilizes 4 data pairs in comparison to Fast Ethernet which utilizes 2 data pairs. Further, Cat 5e supports speeds of up to 1000 Mbps. It’s flexible enough for small space installations like residences, though it is still used in commercial spaces. Of all the current cabling options, Cat5e is your least expensive option. Cat6 wiring can support up to 10 Gbps and frequencies of up to 250 MHz. While Cat5e cable features 1.5-2 twists per cm, Cat6 cables are more tightly wound and feature 2 or more twists per cm. (The amount of twists per cm varies upon each cable manufacturer). Cat6 cables also sport thicker sheaths in comparison to Cat5e. Though standard Ethernet supports distances of up to 100 meters, CAT6 cable only supports 37-55 meters (depending on crosstalk) when transmitting 10 Gbps speeds. Its thicker sheath protects against Near End Crosstalk (NEXT) and Alien Crosstalk (AXT). Cat 6 cables are also great ethernet cables for gaming due to their high data transfer speeds and dependability. Even though Cat6 and Cat6a cabling offer higher performance rates, many LANs still opt for CAT5e due to its cost-effectiveness and ability to support Gigabit speeds. Cat6a also features more robust sheathing which eliminates alien crosstalk (AXT) and improves upon the signal-to-noise ratio (SNR). “A” = augmented. The stronger sheathing makes Cat6a cabling considerably thicker than Cat6, also making it less flexible to work with, and therefore, better suited for industrial environments at a lower price point. Cat7 can also support 10 Gbps, but laboratory testing has successfully shown its ability to transmit up to 40 Gb at 50 meters and even 100 Gb at 15 meters. The newer “Class F” cabling can support frequencies of up to 600 Mhz. That said, Cat7 has not been approved as a cable standard for telecommunications. Cat7 offers extensive shielding to reduce signal attenuation and is relatively stiff in comparison to previous generations of cabling. Both individual pairs are shielded, with an additional layer of shielding over the entire cable. The shielding needs to be grounded and Cat7 also requires special GigaGate45 (GG45) connectors to take full advantage of higher performance features. All in all, Cat6a can perform just about the same as Cat7 but at a lower price point. Most of our AV and IP surveillance customers opt for Cat6a STP or Cat6a FTP. Both offer shielding from alien crosstalk and interference around high voltage lines. Cat7 is suited for use in datacenters and large enterprise networks. Note: 600Mhz/10Gbps/100m (40Gbps at 50m/100Gbps at 15m). Cat8 cable is still in the development stage and not yet ratified. According to the 2016 Ethernet Alliance Roadmap, it will be able to support 25GB and 40Gb Ethernet. Cat8 will be able to support even faster transmission rates at distances of up to 30 meters. Are you looking for burial cables with UV protection? Will the cables be within 6 inches of power lines? Will the cables be in walls? Is flame resistance cabling required for the installation? Here’s a link to an outdoor CAT6 gel filled cable. There are plenty of good manufacturers out there. PLANET is not advocating one supplier. This is just to illustrate. Each cable category has various types of insulation or shielding that installers need to take into consideration before purchasing. There’s no one answer to all questions but the answers to these questions should help the reader decide based on their project. The price difference between the various types can range anywhere from $100 to $600+ depending on type. 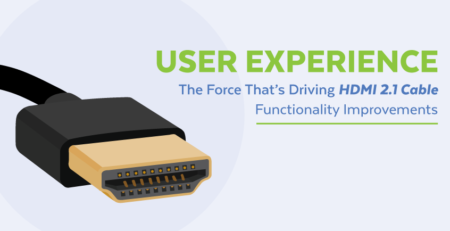 Here’s a helpful overview: Siemon’s category 6A F/UTP shielded outside plant (OSP) cable delivers TIA and ISO performance requirements for shielded category 6A/class EA. Why are copper pairs twisted? When telephone lines were first deployed alongside power lines, Alexander Graham Bell, popularly known as the inventor of the telephones, was the first person to twist copper pairs to reduce crosstalk between the lines. Twisting the copper cable every 3-4 utility poles allowed for the reduction of electromagnetic interference and an increase in range. Ethernet copper cables adopted the same technique to reduce crosstalk between internal wires (XT) and external wires (AXT). Twisted pair copper comes in shielded an unshielded forms. Shielded copper cable includes protective conductive coating such as braided strands of copper, copper tape or conductive polymer to reduce noise interference. Unshielded Twisted Pair, or UTP, includes no shielding and is ideal for most common LAN environments. Shielded twisted copper pairs, are reserved for networking environments with higher frequencies. There are many types of shielded copper pairs. Sheathing can also envelop all four data pairs. Sheathing can wrap around twisted pairs.There are two sections to a shielded “code”. The first letter signifies the type of shield used to enclose all four twisted pairs of an Ethernet cable. 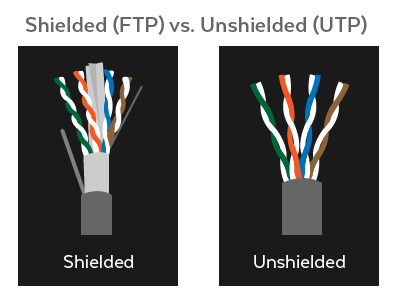 An Unshielded cable is marked with a (U), a cable with Foil Shielding is marked with an (F), and a cable with Braided Shielding is marked with an (S). The second portion of the code, describes if a twisted pair is foiled (F) or Unfoiled (U). TP stands for Twisted Pair. Common in Fast Ethernet deployments, this cable will have a foil shield that wraps around unshielded twisted pairs. This cable will wrap a braided shield around unshielded twisted pairs. This cable braids a shield around a foil wrap to enclose unshielded twisted pairs. This cable wraps a braided shield around all four copper pairs. Additionally, each twisted pair is enveloped in foil. This cable encloses all copper pairs in foil. Additionally, each twisted pair is enveloped in foil. This cable only envelopes the twisted pairs in foil. No sheathing is used. Standard Cat5e cable are examples of U/UTP cables. These terms refer to Ethernet conductors. Stranded copper cables comprise of several thin copper cables. Solid cable conductors comprise of a single, thick copper cable conductor. Want to learn more about the different networking topologies Ethernet is used for? Click Here! In the table «Different Ethernet Categories», it is told that 1000BASE-T needs Cat5e cable. It is False. 1000BASE-T was standardized over Cat5 cable and is ccompatible with the subsequent evolution of Cat5 : Cat5e, Cat6, Cat6a. In the «Category 6» section, it is first told that 10GBASE-T works over a maximum of 55 m of Cat6 cable, ant then that it works over 37 m of that cable. What is the right information ? Hey! Thanks for catching that. You are right and we will definitely correct this asap! Louis, while technically true, you are rolling the dice trying to get reliable gigabit speeds over Cat5 – especially with runs at max distance (100m) or in environments with interference sources. I’ve seen many environments that tried to run full gigabit on Cat5 with disastrous results – we had to force their switches to stay at 100Mbps. Hi! Can you correct the errors that Louis pointed out, also check the table that shows the “cable type” for cat7 as being “SSTP” I don’t see an explanation for the extra “s”. Do you mean “S/FTP”? Overall this page is fantastic, and I would love to use it as a training guide for my technicians. Thanks Blake for the comment! The changes should be made. I’m still seeing the 55m and 37m discrepancies in the CAT6 information on this page. The distance should actually be between 37-55m depending on crosstalk. I cleaned up the verbiage so hopefully that makes sense. On CAT7 how can I confirm the the shields are being properly grounded? To ensure your cable is grounded correctly, you will need to terminate the shielded cable with a shielded RJ45 connector. The network device will need to be grounded as the cable is grounded through the device. If the network device cannot be grounded, you can solder a ground cable on the tab of the shielded RJ45 connector that also acts as a strain relief. Just a question I will remake my network cabling with CAT6A, but my switch is only CAT6, will this work? or I have to change my switch too. CAT6a will work perfectly fine as the cables will ultimately terminate with an RJ-45 connector. CAT6a cabling will give you the option to upgrade your switch to 10Gb in the future. 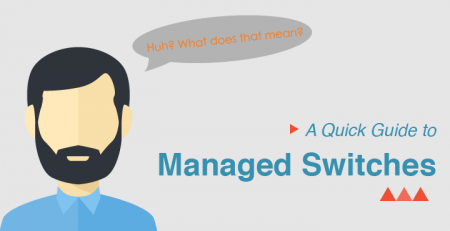 There will not be a night and day difference if you upgrade your cabling but retain a 1Gb switched network. 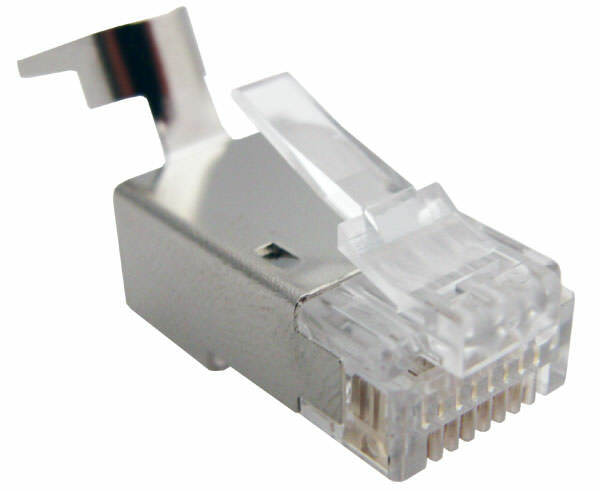 Hi, We have requirement of using CAT 6A for our ethernet requirement. We are planning on using CAT 7 cable. Is the CAT 7 cable compatible with the CAT 6A? And we are using MIL D38999 RJ 45 connector, wil it be compatible with the CAT 7 cable? To answer your questions, CAT6A cable is compatible with CAT7. For the MIL D38999 RJ45 connector, you will need to consult with the factory that produces the connector to see if it’s compatible with the CAT7 cable. Hope that helps. Hi, I’m used to working in the corporate level with a network that supported over 65 k people. I am trying to build a network at home and have ran Cat 6a cables a couple years ago. I live out in the forest and only can get 6Mbps down and 1-1/2 up. So really the cat 6a is overkill. I need to check on the switch creeds but I have an Ac 1200 Netgear Router. Is. There anything I can do to maximize my speed to the clients via LAN or Wi-Fi with only 6Mbps pipe coming in that is wireless internet transmitted on the 2.4 ghz band? Unfortunately , There is very little options living out here and Obama’s Law doesn’t care what high speed quality you have as long as there is anything including satellite, cellular wi-fi = slow and not reliable. Mine is reliable but it is $80.00 a month for 6 Mbps for wireless internet. That is about the best I can do out here even though the next Generation of Hughes is advertising much higher speeds, it takes nothing to use all your package and themn reduced to dial up speeds. I also know that from 30 years of living here that satellite is affected greatly by storms, rain and snow and there is nothing they can do about it and they make no adjustment to your bill for not having anything available. It sounds like you have an extremely fast car but you’re only allowed to drive on bumpy and narrow alleyways. Unfortunately, there isn’t much you can do to increase the speeds of your incoming connection. This is either throttled by your ISP or a limitation due to your geographical location. 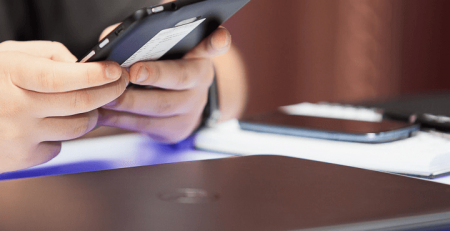 You can configure various types of QoS based on application or per connection but the incoming bottle neck connection will still remain at 6Mbps. Thank you for the reply. It sounds like there is nothing I can do because of the limited availability of high speed Internet in my geographical location. I guess I have to move or wait until there is availability of higher speed internet. I only had dial up for the first 20 years or so of living here, so the 6Mbps feels fast compared to dial up of 56k. I will just have to be content with what I have for now. Thanks again! Harold – similar situation here. 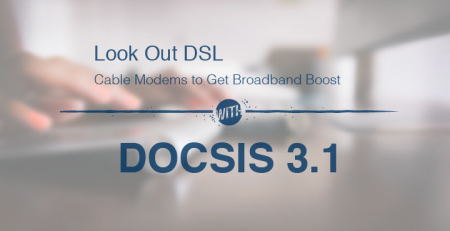 Do you have Bonded DSL available? If so, you might be able to get to 12 or 24M down. its not that dsl cannot run faster its that the company you use is unwilling to invest in upgrading their technology which is common in telcos across the US [more so in rural areas]. Some are starting to get spanked by cable [coax] and beginning to go fiber to the home [FTTH] but even then they are not properly upgrading their main central offices to handle the bandwidth need for anything over 100 Mbs it seems. Still better than 6, but cable is currently deploying D3.1 tech and hitting 1Gbps while they struggle to run 100Mbps. 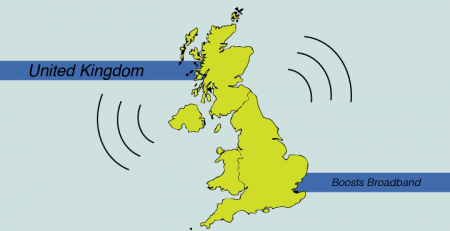 Satellite has a horrid cap and latency, if you’re not doing live stuff or gaming it works ok, but for most, games, ip telephone, and skype kill its value, not to mention its expensive cost and low data caps. Another possibility is cellular, I see people using it ever so often, but the data caps/throttling can kill you if you do a lot of streaming/downloading large files like game demos, videos, and what not. 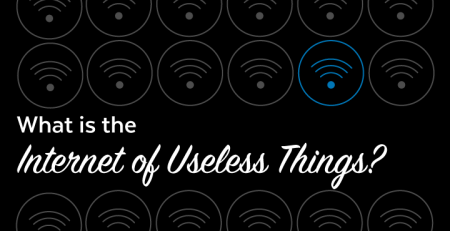 You usually need to supplement it with a home wifi connection for sanity though some swear by it solely, they generally have someone else paying the bill, like their corporate masters. Since funds are not mentioned, you can of course pay for a fiber feed and become your own isp, someone out there can sell you a feed, routing server, training, etc., but the cost may not be what you want to deal with. Won’t know until you look into it. A lot of times the county has a fiber haul to its stuff and can sell you a connection you can set up your own isp, they have to have data connections to various buildings for employment, school, etc.. can’t hurt to see what they say anyway. Great article. I read through a few other “CAT” explanations before I stumbled upon this writeup. Much better than the others. Thanks John…glad you enjoyed it! 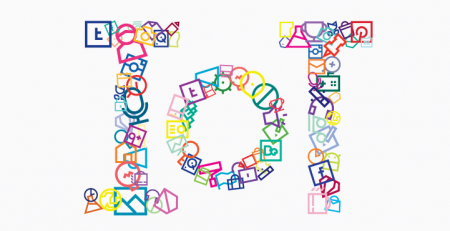 What about power-over-ethernet Poe? Which of these cables support that functionality for use in wiring network security cameras without the need for AC power or DC power to the camera aside from the cat cables? Not quite sure that we understand your question. CAT5 and up will support PoE. You must have a compatible or compliant PoE source such as a switch, hub or injector to power an IP security camera that is also PoE compatible or compliant. “GigaGate45 (CG45) connectors” should be “GigaGate45 (GG45) connectors” – correcting “CG45” to “GG45”. I’m somewhat ignorant on this subject. But I have your standard 100mbps Spectrum cable internet at home and I recently decided to upgrade the Cat 5e cable from the router to my 4K television. I ordered a Cat 7 cable online and I’m waiting for delivery. Will the Cat 7 connector even fit into my router and TV, or does it have a different connnector? CAT7 can be terminated with an RJ45. Not all RJ45 connectors will work though. You will need to confirm the AWG of your CAT7 cable and purchase connectors that fit. Some connectors support 24AWG and other will support 23AWG. It is such a pleasure reading the well thought out questions and the respectful answers in the discussion thread. I never see name calling or nasty, sarcastic comments; supportive corrections and further courteous answers are in abundance. It is a heartwarming pleasure following the questions and discussions by knowleageable, confident, and kind crafts people. I learn a lot following the discussion threads. 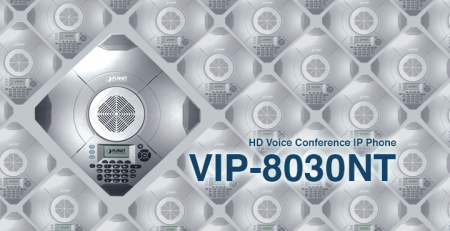 Is there any one that will work best for a running a VoIP phone system? CAT5 is more than enough to handle VoIP traffic. I’ve settled on new construction (home) and I want to take this opportunity and run Ethernet throughout the home while the walls are exposed. I want to future proof the home as much as possible so I was considering CAT7 or CAT6a at the very least. I will be getting Ubiquiti switches and APs (i.e. Unifi). My only concern is comparability with devices slower than 10Gig. Will this be an issue? Do all network devices (Roku, smart TVs, laptops, printers, etc) have to support the 10Gig. I don’t think all of mine do. And if so, will they not function via hardwired connection? Do I need to consider CAT6 instead? Actually, I just realized that the Unifi switch that I have in mind only supports up to 1Gig. So I guess CAT6 is my best option. Yes, we agree that CAT6 is the best option. Non-techie here … trying to keep up with a middle-schooler who is upset at our slow internet speed. We have Verizon Fios and have just upgraded to the ‘gigabit’ service. We have a Verizon Fios G1100 Quantum Gateway Wireless Router. My son stated that I need to connect with an ethernet cable to optimize the speed on his games – what level ethernet cable should I purchase – Cat 5, 6 or 7? Also, there are a couple of existing ethernet cables in the house as well as some coaxial cables connecting the TVs – do all the cables need to match to optimize the speed? Please let me know your thoughts. Thanks. We need a little more information to answer this question. Please contact support@planetechusa.com for more help. Thanks! Why broadcast Cat7 as an approved cabling standard, when it’s not? Category 7 was skipped altogether, and Category 8 cabling was approved for use. You’re confusing a lot of people into buying a product that isn’t approved. You’d be better off warning them of buying cheap China made cables, as opposed to a non-standard. CAT7 was ratified in 2002 but was not standardized nor recognized by the TIA/EIA. It is mentioned in the blog to let readers understand that it does exists but not popular due to equipment manufactures sticking with 8P8C connections rather than TERA, GG45 or ARJ45. I am considering moving to IPTV from U-verse and desire to know your opinion on which CAT cable is best suited for this use. Also, is an HDMI to RJ45 Network Extender Converter Adapter, 30M HDMI to Dual RJ45 Network Cable Extender, Splitter, Repeater by Cat 5e or Cat 6 1080P for HDTV HDPC PS3 STB recommended between my router & HDMI televisions for display? If not, please provide your recommendation. I am new to all this, but wish to learn how I can move smoothly into the future with the technology available. Your thoughts, comments and, clarifying questions are appreciated. Thank you in advance for your timely reply! CAT5e will do the job but if this is a new install, go with CAT6A. You can also go with CAT6A STP for added peace of mind due to the shielding. Not too sure about the splitter and set top boxes though. Hope that helps! Very nice article. What about cat6a i have heard many people praising cat6a cable as compared to others and can you please tell me that is cat6a is better or cat7 or they are equal. I agree that, Cross sections of different category types of Ethernet reveal differing internal physical compositions. This is the best atricle to describe different categories of Ethernet cables for better connection. Thanks for sharing..!! Very worthwhile information. Thank you. Yes, as long as the cable is rated for burial. The jacket is typically made or has an additional PVC jacket. Thank you all for this very educating blog, it’s helped me understand a lot that I wouldn’t have figured out if I had not stumbled onto this. I love your website…lots of clarity, straight forward and easily understood. As a networking professional I found this piece of writing very very informative. Precise and full of information but, for making a better choice for a best business I will strongly say that people should research more about these cables. This was a good article about the ethernet cables categories. User must have full information before getting on in work. For the perfect match of cable I suggest to try: http://www.tscables.com at least once. After that there will be lots of variety of good ethernet cables on your list. However I have an additional question on the topic of selecting the right cable. I’ve just moved into a new apartment (new building), and have lan infrastructure in the apartment. I want to check what type of cables have been used in the walls – is there a way to test it? I’ve got a gigabit lan from the broadband router and I want to make sure that the cables in the walls support that as well. And to my understanding 5e cables would be enough to connect the router to the lan switch / sockets. Most likely a new building would use at least CAT5 and that will support gigabit speeds within the confine of each apartment. Really good article. In the table, under cat 6, it is listed that the max speed is 10/100/1000 Mbps…. should it not be the same as cat 6a (10,000 Mbps) ? Yes, it can go up to 10,000Mbps but only up to 37 meters. We have 100mbs currently at our home and will be upgrading to 1 GB plans once they are available in our city within this next year or less. I am going to wire our house for the first time with Ethernet cables running through the walls from our office upstairs (where the modem and router is) to each of the 3 bedroom and TV room. This will require at times running up through the attic or straight down to the crawl space and then up / down to the outlets in each room. So I can see a few being 100-200 ft easy. Given the distances vs speed retention / loss due to shielding / etc… Will Cat6a be sufficient for my immediate goal of going to 1 GB plus any reasonable future upgrade ability prepping? Or do we need to look at Cat7? 22- 23AWG shielded CAT6A will work just fine. CAT7 on the other hand is not recognized by TIA/EIA and requires a different connector at the ends such as GG-45. These connectors will not be compatible with most devices on the market today. You may also want to consider fiber if cost is not a factor. This will definitely future proof the location. 2) My Central point of this network will be under the stairs along with all the other central point (electric ,gas,etc) and most likely Ethernet cable will be very close if not touching with the electric wires as they will be using same feed path to the sockets. You need to consult building codes for your area. Here, you cannot run cables in that manner unless you install a conduit. Typically I have seen speaker/ethernet/etc. cables are always run between different wall studs than ROMEX. Wow nice post. I like it . I learn more on the post. Thanks for this post…………..
that was so informative. I loved the article.there are so many things today I have learned from this so thank you for that. did anyone experience cat 6 cables testing lower than cat 5 in certain locations? said location tests cat 5 at their nominal cat5 or cat 5e. same cable from the same box, with same jacks was tested in a different location at approximately the same length, approx. 120 feet, and tested better than cat 6e. Jacks are cat 6 and same manufacturer of cable and jacks was installed with successful cat6 testing in other locations. Ethernet cabling is comparable to gasoline. You’ll find stations at just about every city block. The quality of the gasoline will be dependent on the refinery. Certain brands will provide more detergent in the gas or better fuel economy. As for Ethernet, it comes down to quality of copper (impurities), thickness and consistent twists per inch. Not all CATx cabling is created equal but they come close within their category. Although NOT recommended, we have seen CAT6A FTP laying directly above 110VAC lines with no affect on data transmissions. CAT6A FTP rated for direct burial would be a good choice even if insulated in a conduit. The waterproofing is an extra countermeasure if there are any leaks in the conduit. The foil of FTP and grounding wire will also lower the chances of interference next to electrical lines as well. Be sure to use connectors with grounding straps or you can solder the grounding wire from the FTP cable to a ground strap as well. Really great explanation of of cat 5 / 6 / 7 cables and you have cleared all my doubts. Thanks ! Are difference between patch cable (short 2~4 mt, used in data center) and backbone cable (long 30~60 mt, used everywhere)? A (local) famous wiring company told me that cable behaves like a “filter”, so cables used for wiring network and patch cables have different twisting technology. Different cable categories will have different twist rates. The most commonly used network cable would be CAT5e and CAT6a. The length can be as short as you want but should not exceed 100 meters for Ethernet. Data centers will attempt to use fiber optic if possible rather than copper. WOW!- Just ran across this, looking for the difference between ‘6+’ and 6a- didn’t find but found you. After listening to the eulogies of President George H W Bush, and everyone praising his civility towards all, I agree with the previous comments that laud the tone of the content here- no sniping, flaming other posters, etc. That said, I would like to post my 2 cents worth. For anyone considering 6a F/UTP. F/FTP, or “cat7”, let alone cat 8, the bend radius isn’t going to work in a normal wall, without special jacks/face plates. If you try to use off-the-shelf products, you are going to bend past the point of compromising the functionality of the cable. Several years ago, I jacked a new construction residence- electricians had pulled “cat7” cable for data- my supplier had no idea what I was talking about, told me to call Leviton- did, the tech I talked to said cat 6 jacks, since it’s 23, not 24 ga wire- he said it has not been approved by EIA/TIA, so nobody made jacks. I used cat6. What’s the difference between Cat6 and Cat6e? I see many cables advertised as Cat 7 and “flat”. As your article refers to Cat 7 cable as being stiff (and I’ve seen that said before) does that mean that these “flat” Cat 7 cables are not actually Cat 7? Does the Cat 7 specification mean that there must be so much shielding that flat cables cannot be Cat 7 or has technology changed to allow this and, if so, how? I have come across some plenum wire (CAT5 & 6) that is considered ‘Chinese’ Plenum and ‘American’ plenum. There is a price difference between the two. I am being told that they are very similar and have the same burn time. Can anyone help me with the difference between the two? This is the best explanation of Cat5e, Cat6 and Cat7 on the Internet for those who want to use cables for various application. Thanks for this, it cleared all my doubts! I was browsing for up-to-date cabling information and wound up here…so glad I found you guys! Great information but more important is the wonderful comments. I pretty much knew “my cats,” just needed a refresh. I retired from BellSouth Atlanta in 02, before they rolled over to AT&T. I was a Special Services tech installing data circuits, T-1’s and turning up/testing fiber nodes (https://www.techopedia.com/definition/26908/fiber-to-the-node-fttn) in the field. The job was all about getting data from A to B by the most efficient means possible and light was the key to all things fast. Twisted pair cable, be it cat5 to the new cat8, as good as it is, it’s at its limit as to how much data can be pushed through that pipe. Coax is just more efficient handling data. That said, if I could get fiber I would never look back. I have Xfinity internet 250 Mbps, it works fine for my needs, will average 215 to 235 down and 10 up. I cabled my home with cat6 as cat7 is overkill. (IMO) I pulled two cables per outlet/devise (future Growth) Distance was no issue, longest pull was 35 meters. All my cabling terminates to a patch panel in the basement. I also wired my 4K POE security camera system to a dedicated POE switch in the same patch panel. Camera resolution can be set to full 3840×2160 and record at 30fps, run 24-7, crystal clear and no latency. Cabling is the heart and soul of your system, do not skimp, straight runs, no kinks, stay clear of power best you can, plan your cable runs on paper, do-not-use-staples! Instead, staple large tie-wrap/zip-ties to attic trusses this keeps your cables above the attic floor and away from power, make large loops with the ties and no sharp 90 degree angles, invest in a cable tester and crimp tool, they’re cheap! I hope I have not been of topic, network and cabling is my thing. I just enjoy helping folks as it can be intimidating…Thanks! Thanks Tom for the information! I am planning to install a cabling network in a residential block of 400 apartments, 10 floor high. It will consist of 4 racks, a 10 Gbps backbone (fibre or aggregated copper) and a 1 Gbps access layer network for 450 video intercoms, 200 IP camera’s, access control equipment for 120 doors(controllers, readers)), and about 50 WIFI acces points, using PoE switches (total 1000 ports) mostly 15 and some 30 Watt standard. what would be the most suitable CAT cables category and material characteristics and why?